A very common piece of advice in spoken word workshops or critique circles is “just do the poem.” So many of us, especially when we’re just starting out, instinctually want to frame, contextualize, or introduce the poem. This manifests as any number of statements like “this is just something I wrote when…” or “this isn’t really done; I’m not sure if it has a title yet, but…” or even “this is terrible but I’m going to share it anyway,” etc. That being said, I love contextualizing poems. The more that I’ve moved away from slams and toward performing hour-long sets, the more I’ve grown to appreciate the power that can come from framing notes, artist statements, and organic dialogue with the audience. We all listen and learn in different ways, and these fourth wall-breaking moments can sometimes be as meaningful as the poems themselves. 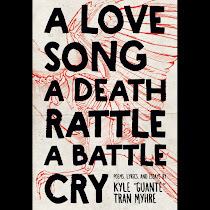 In that spirit, I wrote this as an introduction to my book so that it could both contextualize my poems and offer an introduction to the form—and culture—of spoken word for anyone who may not already be part of that community. Of course, this list is not about capturing all of spoken word and slam poetry culture in one piece of writing; part of the beauty of our community is that we don’t all agree on everything, and the work that we do is fluid, dynamic, and impacted by context, identities, and intertwining thought-currents. I do not expect every spoken word artist or listener out there to agree with everything I write here. And that's cool. What follows is more so an illumination of a few pet peeves and misconceptions that I run across all the time. Though I’m no voice-of-God authority on this subject, I am a practitioner; my hope is that this piece can add additional clarity, depth, and nuance to the ongoing conversation. "Spoken Word" is an umbrella term. It refers to poetry that is read aloud; it may contain elements of theater, stand-up comedy, storytelling, rhetoric, jazz, hip hop, or other forms. We could go deeper with this, in terms of the difference between "recitation" and "performance," or the difference between creating work that is meant to be performed vs. work that is about the page first and then happens to be performed (and how each approach impacts the writing itself), but I think this is a good starting point. You could also potentially use the term "performance poetry." "Slam Poetry" is often used interchangeably with "spoken word," but I would argue that it means something more specific: slam poetry is spoken word performed at a poetry slam (more on that later). While there may be certain tropes or approaches that are more common in slam poetry than in other kinds of spoken word, the real difference is not about form—it's about context. "Beat Poetry" refers to the poetry of the Beat Generation, whose work is now 50+ years old. Please do not call a 20-year-old spoken word artist a "beat poet" unless that's some kind of explicit shtick they're running with. The stereotypical imagery of berets and bongo drums is simply not what spoken word is today. "Spoken Slam Hip Hop Beat Jams" is not a real thing. Additionally, I was once called a “slap poet,” though that was probably a typo. Probably. Of course, we don't all have to be on the same page regarding our enjoyment of or appreciation for spoken word. But to say that "it isn't poetry" (as many do, with gusto) is closed-minded and, frankly, ahistorical. After all, the history in which poetry was primarily about the page is shorter than the history in which poetry was primarily oral (see next point). Furthermore, I can't help but notice the racist and classist undertones in the bizarrely narrow definition of poetry that so many hold on to so desperately; I am interested in asking why that narrow definition (the one that says that poetry must rhyme, or be metered, or be published, or follow established rules) persists in the minds of so many. Where does that definition come from? Who benefits from it? Now, this does not mean that I believe that all spoken word is beautiful and perfect and amazing. For every spoken word piece that I love, I can think of another (or five) that I despise. The argument here isn't that we shouldn't have standards; it's that we should think critically about the history of those standards, and who has had access to the spaces in which they were created. Finally, it is also helpful to note that the "page/stage" divide is an artificial one. Lots of great spoken word artists are published poets, award-winners and professors. Lots of page poets are very good at performing their work. As different as spoken word and written poetry can be in many regards, there's still an enormous overlap. Even though spoken word is very often characterized as a new, underground artistic phenomenon, or as a novel, radical reconceptualization of the relationship between poetry and its audience, it's important to note that spoken word has been around for as long as language has. It is one of the oldest artistic practices that we have. The griot, the storyteller, the person responsible for orally passing down information from generation to generation: every culture on earth has some kind of analogue to this. The Iliad and Odyssey were spoken word poems. We can trace the current spoken word boom back through the Black Arts Movement, the Beat Generation, the Harlem Renaissance, deeper and deeper into history, and we'll get to the griot. And sure—when most people today talk about "spoken word," they're referring to the 30 year-old manifestation of the practice driven by poetry slams, Def Poetry Jam, and viral videos. But it is important to know that this art has deeper roots, and that those of us who do this are taking part—knowingly or not—in a much older cultural practice. I understand that for a lot of people, slam poetry is a punchline. The stereotype of the grim, ultra-earnest college kid shouting clichés about how "the man" is corrupt, in a forced rhythm, while a dozen people in a coffee shop snap their fingers, is deeply embedded in pop culture. But I've been performing in poetry slams, traveling around the country for spoken word shows, and watching poetry online for a decade now, and one thing that always strikes me is how authentically diverse the community is. After all, a fundamental pillar of the culture is the idea that everyone has a story, and every story matters. People approach spoken word from all walks of life, from all identities, and from a myriad of approaches to the form. I would say that the culture is largely driven by young people, and young people of color especially, but it is by no means dominated by a singular voice. Another fundamental pillar of spoken word culture is the idea that poetry is for everyone. Anyone can be a poet. Anyone can serve as a judge at a slam. Anyone can sit in the audience and decide what they like or don't like. It isn't about what MFA program you got into, or how many poems you've gotten published, or who co-signs you; it's about how we build community with one another through the telling of our stories and the sharing of our words. What this means in practice is that no matter who you are, or how much experience or training you have, you can sign up at an open mic or poetry slam and share something. So of course, if you're an audience member at some random open mic, you are not guaranteed two hours of brilliant writing. A lot of spoken word is pretty bad. But the larger point here is that most art is pretty bad—we just might not ever experience the “bad” indie rock, visual art, dance, etc. The spoken word community, however, is intentionally set up in such a way where the great and not-so-great exist in the same spaces. And though I've sat through many a not-so-great slam, I would still argue that this is a very positive thing. The spoken word community includes icons like Andrea Gibson and Saul Williams, right alongside some 15-year-old kid performing at their very first open mic. It includes Marc Bamuthi Joseph's boundary-pushing spoken word theater work, right alongside a part-time bartender who competes in poetry slams for a little extra money. It includes the best writers I know—Patricia Smith, Bao Phi, Suheir Hammad, etc.—and countless people who are just starting out, or still growing, or trying to figure out what they have to say. It's about process and product. It's about the function of art beyond the art itself. This is immeasurably valuable, and part of why spoken word represents something deeper than just another hobby or literary/artistic movement. A poetry slam is a poetry reading staged as an Olympic-style competition. Five judges are picked randomly from the crowd, poets perform, and the judges give those poets scores based on content, form, delivery, originality, or whatever they want. It's silly, and most of the people who participate know that it's not really about the points; it's about getting the audience engaged. Still, slams are popular all over the US (and beyond), and have become the focal point for spoken word's resurgence. Although the competitive element turns a lot of people off, I like poetry slams. I like the symbolism of them: write for the people. Write something that connects. Have fun. I like that the judges are random weirdos and not creative writing professors or literary critics. Everything in points #4 and #5 comes alive at the poetry slam. Slams aren’t perfect, and there are important conversations to be had about the intersections of competition, art, identity, and trauma, but I still believe that they are valuable. That being said, it is important to note here that spoken word happens in other spaces too, and that a lot of the value of slam is that it is one outlet among many. For those of us who grew up in the slam world, it can be too easy to forget that slam is just one way to participate, and that participating solely through slam can be unhealthy (and/or just boring). You can find spoken word at open mics, themed readings, political rallies, classrooms, social justice education programs, churches, punk shows, prisons, and many other spaces too. I've heard people talk about how spoken word is just another element of hip hop. I've also heard people talk about how hip hop grew out of the work of early spoken word pioneers like the Last Poets and Gil Scott-Heron. I would say that there is truth in both statements, but also that both statements make it easy to oversimplify the relationship. I think that hip hop and spoken word—as both art forms and cultures—have been in dialogue with one another for the past few decades, but also that neither one is wholly indebted to the other. They overlap—in terms of audience, artists, roots, styles, and approaches—but they are also distinct cultures and communities. This comes up in conversations about form. Students ask me all the time: "what's the difference between rapping and spoken word?" There's a deeper conversation we can have there, but in short, I think of rapping as a specific kind of poetry; and like any poetic form (haiku, sonnet, etc. ), it has rules. Rapping rhymes. It is performed at a set tempo and rhythm. It is performed over music. Spoken word, on the other hand, can rhyme, but doesn't have to. It can be performed to a set tempo and rhythm, but doesn't have to be. It can be performed over music, but it doesn't have to be. There are fewer formal guidelines with spoken word and slam poetry. But in terms of substance—you can rap about anything, and you can write a poem about anything. Of course, both spoken word and hip hop are about speaking truth to power, and lifting up the voices and narratives that are so often silenced in our society. Both are about the implicitly political act of a human being standing on a stage and saying something to a hundred other human beings (especially when you, and/or that audience, hold identities that are misrepresented in the broader culture). Like I said, there is overlap. But where the casual observer might just see “urban youth saying stuff into a mic” and assume that the two forms are exactly the same, I would encourage us all to have a more nuanced view of their similarities, differences, and histories, in order to pay the proper respect to both. Again, there are no rules with spoken word, beyond the fact that poetry slams have three-minute time limits. This applies to form, but also to substance. A poet can write and perform about any topic they want. Of course, the stereotype is that all spoken word is ranting about the revolution; and to be sure, poetry slams generally do feature a lot more poems about identity, power, oppression, struggle, and politics than poems about trees or "pure" lyrical experiments. Part of the reason for this, I would argue, is that as much as spoken word is poetry, it is also something more. It's a public forum for people to get together and have the conversations that we so often don't get to have in our everyday lives. It's a platform to say something that means something to you in front of a hundred strangers. And when so many spoken word practitioners are young people, and/or people holding oppressed identities, and/or people with voices that have just generally not been valued (or even noticed) in society, it shouldn't surprise anyone that so much spoken word is political. It should be. It needs to be. Every few months, someone publishes another “Is Poetry Dead?” essay. I understand why—it’s click-bait, and there are certainly valid arguments to be made on both sides of the debate regarding aesthetic populism, outreach to new audiences, the accessibility of MFA programs and other weighty topics. The problem, however, is how the question is framed: poetry is dead because fewer people buy poetry books or read poetry journals, or poetry is dead because it’s stylistically stagnant, or poetry is dead because it doesn’t have a presence in the upper echelons of American media or culture. Left out of these equations, due to either simple ignorance or a willful distaste for the form (and its practitioners), is spoken word. Even the inevitable response essays and counterpoints that talk about how poetry is still vibrant and important almost always ignore spoken word. And spoken word is very much where poetry is thriving right now. At the time of this writing, Button Poetry (the biggest distributor of spoken word videos online) has a YouTube channel with more than a half million subscribers and well over a hundred million views. And they're just one channel. Even using myself as an example: my work has nearly two million YouTube views, and I make my living as a touring poet traveling around the country. When I do that traveling, I notice spoken word clubs sprouting up at just about every college and high school that I visit, as well as poetry slams in cities across the country generating big, energetic crowds. Which is all to say: this movement is popular and still growing. Especially when thinking about Button and its impact on thousands of people around the world: spoken word is making people (especially young people) excited about poetry. Its viral boom is sparking a new generation of writers, poets, performers, and storytellers—all of whom may start with poetry slams, but then branch into theater, publishing, music, or other arenas. We're still in the middle of that ripple effect. One of the running themes here is that spoken word is about us, more than it’s about me, or you, or whatever poet has the most YouTube views. It is a participatory culture. While I make a living as a spoken word poet (along with a growing handful of others), it is important to understand that you don’t have to go “all in” to do this. Most spoken word poets have day jobs. Most never go viral. Most don’t win every poetry slam that they enter. And this should be celebrated. I'm not sure that we need more professional poets; I think we need more cab drivers, teachers, nurses, organizers, and service workers who write poetry. I can imagine someone reading this and saying “easier said than done.” And sure, performing in front of people isn’t always easy. 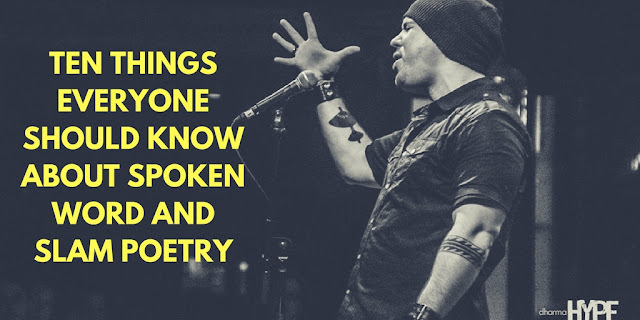 To support anyone who might be interested, I’ve tried to collect a few resources here, including a video series of tips, tools, and tactics for aspiring spoken word poets, a list of all of the open mics and poetry slams in my community, a list of 100+ favorite poems by other artists, and more. It might be a matter of finding the space first—a local open mic, an online community, even just an informal writing circle of three or four friends. From there, it’s about diving in, having fun, and figuring out what you want to contribute. Let’s build. If anyone out there has any alternate takes, critiques, or just general thoughts, feel free to leave a comment. Thank you. I'm excited to read the rest! I have not participated in poetry, other that watching/ reading/ listening in years. I think you have changed that. Some people say that spoken word is not poetry because these artists make it look easy. It is not easy. Just grab a pen and try to write like them if you do not believe me. Most probably you will find yourself staring at a blank sheet of paper for an hour. I like written poetry more, Poetry Foundation especially, but spoken word is poetry, as well. The thing is... it gets more attention and poets that don't do spoken word are envious of that numerous public. Donte Collins for example, he is a mix between the two, spoken word and written poetry. And one more thing: spoken word sounds terrible if translated. Maybe this phenomenon will be reduced to English only especially because of the cultural jazz/hip-hop background. Other cultures have other tools. Thank you so much, Guante! This really breaks down the broad meanings of spoken word and its misconceptions.